Patch the Pirate is headed for China in this action-packed adventure. The Captain is joined by Who Flung Chow (the cook from Camp Kookawacka Woods) and the newest crew member - Pistol Pirate (Patch's grandson). 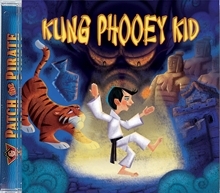 Wushu, The Kung Phooey Kid, is anxious to compete in the Kung Phooey Championship but needs to learn a few important lessons first. A mysterious singing Ming vase becomes an important clue in the disappearance of Pong-Ping, the great Kung Phooey master. Following the riddle of the vase, Patch and crew head out on a trek to the Great Wall of China. Hidden dangers lurk along the way, and it will take great courage and faith to overcome the giant obstacles. Join Wushu as he learns to make right choices and finds out the difference between earthly and heavenly treasures.